In 1889, Bruno V. Nordberg founded the Nordberg Manufacturing Company (Nordberg) in Milwaukee, Wisconsin to build various industrial machines. In the 1910s, the company entered the heavy-duty diesel engine market. Over the years, Nordberg expanded its stationary engine catalog to include engines from 10 hp (7.5 kW) to over 10,000 hp (7,457 kW). 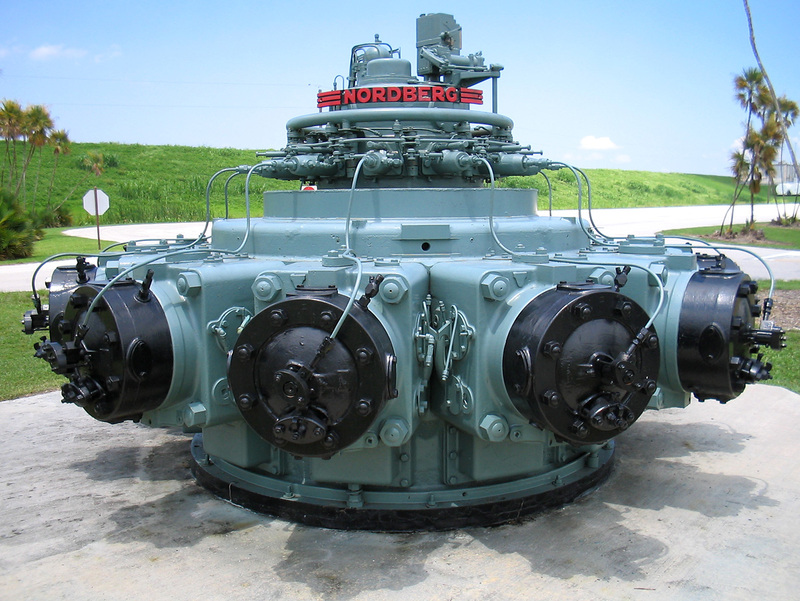 To further expand its market, Nordberg developed a line of stationary radial engines in the 1940s. A 12-cylinder Nordberg diesel radial engine. This engine displaced 29,556 cu in (484.3 L) and produced around 2,000 hp (1,500 kW). Note the fuel injector in the center of the cylinder head. The Nordberg radial offered several advantages over the stationary inline engines that were the current standard. With its cylinders horizontal, the Nordberg radial’s output shaft was in a vertical position. Although the engine was built primarily to generate power for the electrolytic reduction of aluminum, its arrangement was perfect for pumping applications. In addition, the configuration of the radial made it more compact and much lighter than a comparative inline engine. The Nordberg radial took up about half the space of an equally powerful inline engine and could be installed on a much lighter foundation. The Nordberg radial was first introduced in 1947. The first engines were spark-ignition natural gas burning units that quickly established themselves as reliable and economical. These engines had two spark plugs located in the cylinder head. A single cam on the crankshaft actuated a gas valve for each cylinder. This gas valve allowed the natural gas into the incoming scavenging air for the cylinder. Nordberg continued to develop the radial as its use spread to central power stations and various pumping applications, primarily for flood control and at sewage treatment plants. Nordberg soon developed a diesel version of the engine and a version that could run on a mixture of diesel and natural gas, which Nordberg dubbed Duafuel. The Duafuel engine could run on 100% diesel or as little as 5% diesel and 95% natural gas. This flexibility allowed the engine to operate with the most economical fuel mixture possible. In the diesel and Duafuel engines, the single cam now actuated a fuel pump for each cylinder, and the diesel fuel injector was in the center of the cylinder head. 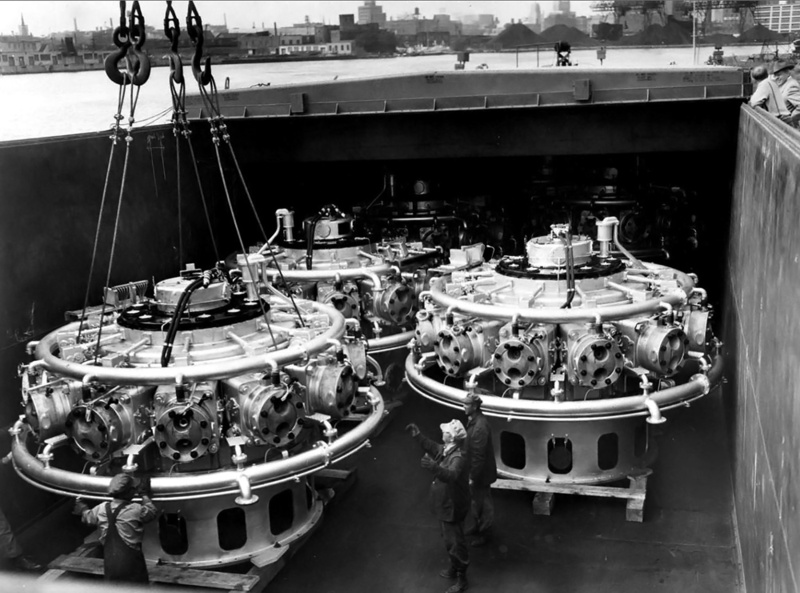 A number of Nordberg 12-cylinder spark-ignition radial engines are loaded into a barge in Milwaukee, Wisconsin. Note the two spark plugs in the cylinder head. This image also shows the base of the engine that would extend under the operating floor. A later development was the addition of two turbochargers and intercoolers that increased the engine’s thermal efficiency while decreasing its fuel consumption. It is not clear whether or not the turbochargers were available for all engine types or just for the spark-ignition engines. 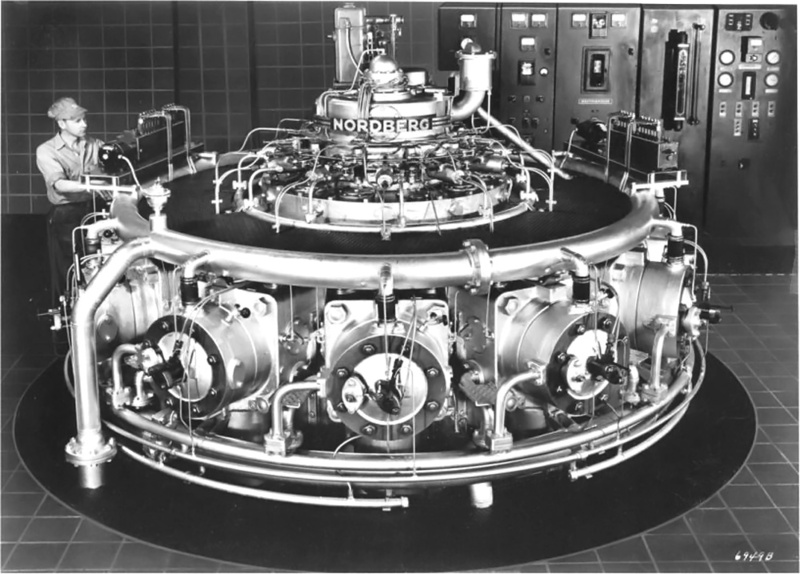 The Nordberg radial was a two-stroke engine with a 14 in (356 mm) bore and a 16 in (406 mm) stroke. Each cylinder displaced 2,463 cu in (40.4 L). There was an 11-cylinder (RTS 1411) and a 12-cylinder (RTS 1412) version of the radial engine, displacing a total of 27,093 cu in (444.0 L) and 29,556 cu in (484.3 L) respectively. The 11-cylinder engine was 12.125 ft (3.70 m) in diameter while the 12-cylinder was 13 ft (4.96 m). The engines had an operating speed of 400 rpm. Output varied depending on the engine’s configuration. A 11-cylinder spark-ignition engine was rated at 1,340 hp (1,100 kW), an 11-cylinder diesel was rated at 1,655 hp (1,235 kW), and a 12-cylinder diesel was rated at 2,125 hp (1,585 kW). The 11-cylinder and 12-cylinder engines both had a crankshaft cast of high tensile alloy iron. The crankshaft had upper and lower main bearings. Neither engine had a master connecting rod; all connecting rods were of the articulated type. The crankshaft arrangement of the 11-cylinder Nordberg radial engine. All the connecting rods are attached to the master gear, which is not labeled in the image. Each of the 11-cylinder engine’s connecting rods was attached to a large master gear via a knuckle pin. The master gear sat just above the connecting rods and was mounted on the crankshaft’s single crankpin. The master gear did not rotate, being restrained by two pinions and a stationary gear. The lower pinion rode on the master gear opposite the crankpin. The lower pinion was mounted on the same shaft as the upper pinion, which engaged a stationary gear at the top of the engine. 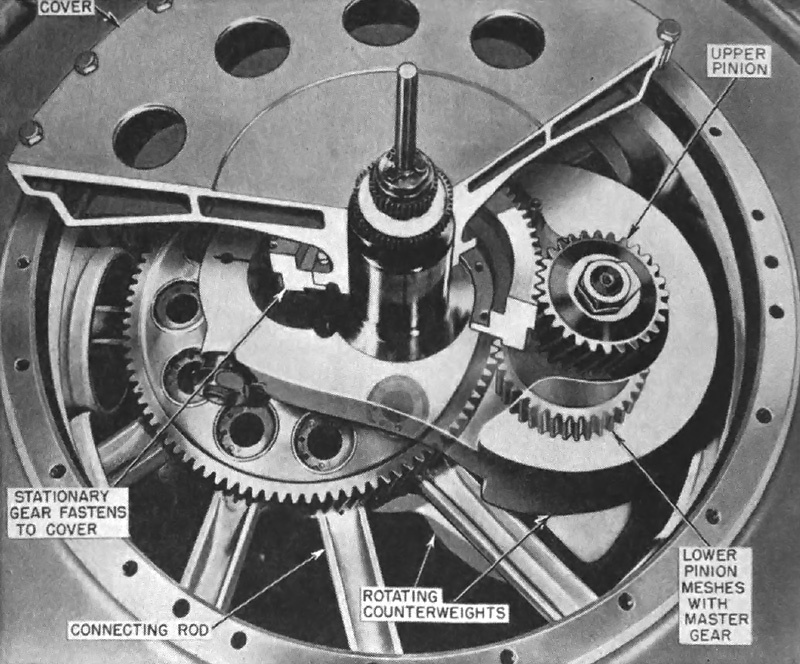 Since the master gear was mounted on the crankpin, it moved in a circular motion with the crankshaft, and each knuckle pin subsequently moved in a circular motion. This design eliminated the need for a master connecting rod and provided good balance. The 12-cylinder engine did not employ a master gear like the 11-cylinder engine. Instead, each connecting rod was attached to a master bearing via a knuckle pin. The master bearing was mounted on the crankshaft’s single crankpin. Two opposing connecting rods were rigidly connected to extended knuckle pins. Each of these extended knuckle pins carried a small restraining crank. The two restraining cranks were connected via a larger restraining link. This linkage prevented the master bearing from rotating but allowed it to move in a circular motion, like the master gear in the 11-cylinder engine. The 12-cylinder’s crankshaft arrangement was designed by Donald I. Bohn and awarded US patent 2,584,098 on 29 January 1952. The crankshaft arrangement of the 12-cylinder Nordberg radial. Compare with the image of the 11-cylinder’s crankshaft. 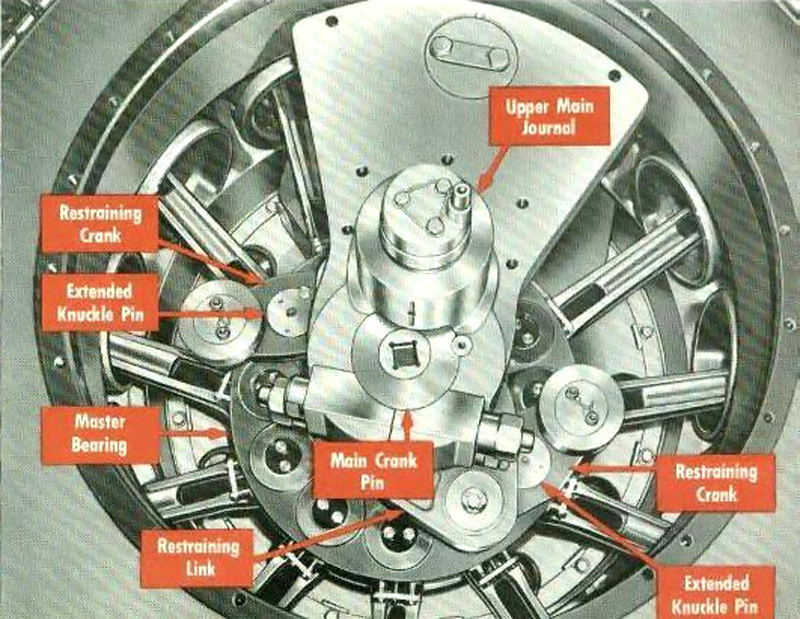 The Nordberg radial engine had a single-piece cast iron crankcase and sub-base. Each cylinder was drawn to the crankcase by four long studs. The cylinders had intake ports positioned on the top side of the cylinder wall and exhaust ports on the lower side. The exhaust ports were closer to the head than the intake ports to allow for good cylinder scavenging. Either an electric or a geared blower pressurized the intake air and aided cylinder scavenging. The exhaust was expelled into a manifold located under the operating floor. The cylinders fired one right after another in successive order. By the mid-1950s, the Aluminum Company of America (Alcoa) had 220 normally scavenged and 22 supercharged Nordberg radial engines installed in its Port Lavaca, Texas aluminum plant. Combined, these engines could produce 475,000 hp (354,207 kW). 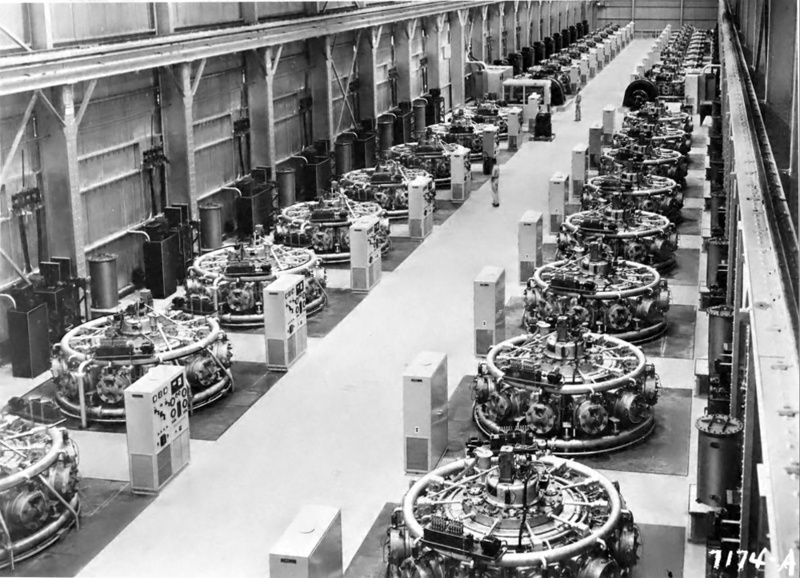 The engines were arranged in seven powerhouses, consisting of around 40 engines each. Kaiser Aluminum used 80 Nordberg radial engines in its reduction plant in Chalmette, Louisiana, accounting for 150,000 hp (111,885 kW). Various smaller engine installations occurred in municipal power plants and pumping stations. In 1956, a 12-cylinder Nordberg radial engine was put into service at the municipal power plant in Winterset, Iowa. This engine is still in service as of 2016. In 1957, three 11-cylinder Nordberg radials were installed in the South Florida Water Management District Pump Station S-9, just west of Southwest Ranches, Florida. Each of these engines powered a pump with a 143,625 gpm (543,679 L/m) capacity. These Nordberg radials were retired in 1989 because of the scarcity of spare parts. One of the engines is currently on display at John Stretch Park in Lake Harbor, Florida. Nine 12-cylinder engines were installed in the Wastewater Treatment Plant at Deer Island (Boston), Massachusetts in 1968. Over five years, each engine had averaged 22,315 hours of operation. This equates to the engines running 12.25 hours a day, every day, for five years. Forty Nordberg 11-cylinder spark-ignition radial engines in one of seven powerhouses at the Aluminum Company of America plant in Port Lavaca, Texas. Over time, the engines did have problems. Because the cost to inspect the crankshaft was practically as much as replacing it, Alcoa adopted a policy to forgo inspections and run the engine until the crankshaft broke—and break it would. A number of other operators followed suit. Another issue was with excessive piston wear. The Deer Island installation had constant issues with various parts breaking, resulting in engines being off-line for extended periods. Since Nordberg was the sole supplier of parts and it could take some time for replacement parts to be supplied, cannibalism of engines occurred when more than one unit was down. In 1970, the Nordberg Manufacturing Company was purchased by the Rexnord Corporation, also of Milwaukee, Wisconsin. In 1973, Nordberg/Rexnord stopped manufacturing diesel engines and parts. This, combined with the difficulties experienced by several operators, led to the phase out of the Nordberg radial engine. In 1987, Rexnord was purchased by Banner Industries of Cleveland, Ohio, and Nordberg was renamed Nordberg Inc. In 1989, Nordberg Inc was sold to the Finish company, Rauma-Repla Oy. At his time, Nordberg Inc manufactured mining equipment, mainly rock crushers. Through mergers, Rauma-Repla Oy became the Metso conglomerate in 1999. Nordberg Inc was renamed Metso Minerals Milwaukee, and continued to manufacture equipment until the factory was shut down on 30 June 2004. The closure ended 115 years of industrial machine manufacture. This entry was posted in Diesel Engines, Stationary Engines on 12 January 2014 by William Pearce. I am doing research on Nordberg Radial Engines, and trying to figure out if the company Nordberg is still viable. I am also trying to locate someone who could say where the a-c parts were inside of the engines. If you have any additional information at all, it would be very helpful. I’m sorry to say that I do not have any additional information for you. However, I will let you know if I run across anything or anyone that can help answer your questions. I would doubt the company is viable. Nordberg exited the market 10 years ago and exited the engine market 40 years ago. Any void it left would have been filled by now. As a side note, the radial engines seem to be replaced most often by Cat diesels. Great site. The Winterset Iowa City Utilities plant has what I am told is the last working Nordberg radial diesel in the world. When I worked in Winterset the city had gone to Tennessee and retrieved cylinders from a defunct Nordberg for spares. On a hot day, Mid American would call the city and say “We’ll need your capacity today. You have two hours to get them running under load and on frequency.” Coming into town from the north, if I saw a dirty black plume of smoke I knew the Nordberg was running and we were in for a hot day. They also have a Cooper Bessemer I think a V12. Thank you for your comments. I hope the city of Winterset can somehow make sure their Nordberg is preserved when it is finally decommissioned. But who knows, maybe the engine will soldier on for a few more decades. I worked at the Chalmette refinery run by Kaiser Aluminum and was in the “engine room” with the Nordbergs one time. They ran on natural gas and were HUGE and amazingly quiet! If you stood by a cylinder head all you could hear was a muted chuff, chuff, chuff.. as the cylinder fired. They were always run at 105-110% rated capacity. They had the generators on the first floor that looked like enormous green pears! The only time they had trouble with the generators was at startup and shutdown. The lower bearings actually floated on oil when they were at speed, so they never had any load until they were slowed down and then they had to deal with HOT low viscosity oil. They powered Lines 1 and 2, with 144 Noderberg Cells per line. There was a huge bank of oil coolers alongside the building to cool all the oil in the Nordbergs and generators. The plant was shut down when the 20 year gas contract ran out. Thank you for your fascinating, firsthand account of Norbergs in action. Great stuff!